The FECA is a law which provides benefits for civilian employees of the United States who have suffered work-related injuries or occupational diseases. These benefits include payment of medical expenses and compensation for wage loss. The FECA also provides for payment of benefits to dependents of employees who die from work-related injuries or diseases. However, the FECA does not provide retirement benefits. Employees who fully or partially recover from their injuries are expected to return to work. The FECA is administered by the Office of Workers’ Compensation Programs (OWCP), U.S. Department of Labor, through 12 district offices located across the United States. Workers’ Compensation Center is your resource to find answers regarding the FECA program. Are all work-related injuries covered under the FECA? All kinds of injuries, including diseases caused by employment, are covered if they occur in the performance of duty. However, benefits cannot be paid if injury or death is caused by willful misconduct of the injured employee, by intent to bring about the injury or death of oneself or another, or by the intoxication of the injured employee. Is it necessary to report all injuries that occur at work, even minor ones such as a cut finger or bumped knee? All injuries should be reported when they occur since a minor injury sometimes develops into a more serious condition. Benefits cannot be paid unless an injury is reported. Does an employee need an attorney or other representative to file or pursue a claim for compensation? No. However, the employee may obtain the services of an attorney or other representatation if desired. A Federal employee may not serve as a representative unless he or she is an immediate family member of the injured worker or is acting in his or her official capacity as a union representative. An OWCP employee may not act as a representative under any circumstances. The employee must advise OWCP in writing of the name of the representative. The FECA provides compensation benefits to Federal employees for disability due to personal injury or disease sustained while in the performance of duty. 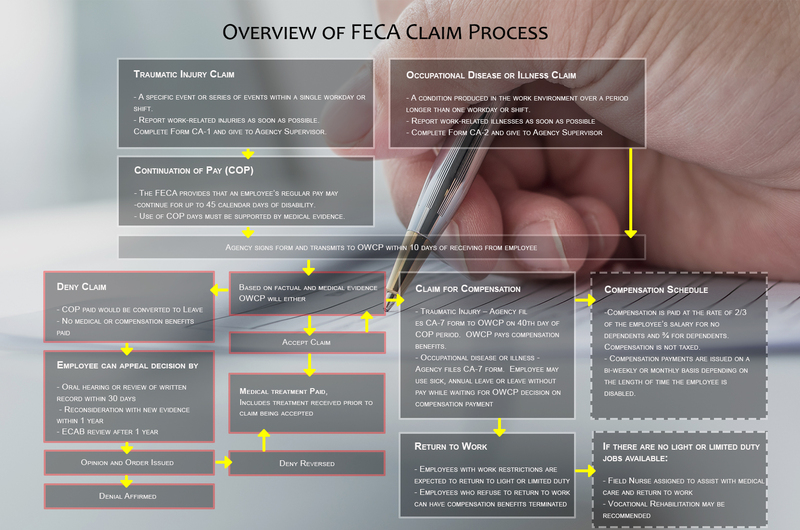 The FECA is a Federal law administered by the U.S. Department of Labor (DOL), Office of Workers’ Compensation Programs (OWCP). The U.S. Department of Labor makes all entitlement decisions. Proceedings under the FECA are nonadversarial. REPORTING – Employees who are injured while in the performance of duty must complete Form CA-1or CA-2 for a work-related injury or illness and report his/her injury as soon as possible to a supervisor. TIME – A claim for compensation must be filed within three years of the injury or death for traumatic events. (If a claim is not filed within three years of the injury or death, written notice of injury to the Agency was given within 30 days after occurrence.) In cases of a latent disability, the time for filing a claim does not begin to run until the employee becomes aware, or reasonably aware, of a possible relationship between the medical disability and the employment. CIVIL EMPLOYEE – It must be established that the injured or deceased individual was a Federal employee. FACT OF INJURY – The claim must demonstrate that the employee actually experienced the accident, event or exposure and provide medical to substantiate a diagnosis which could have resulted from the accident or employment. CAUSAL RELATIONSHIP – Unlike Fact of Injury, which merely determines if a medical condition is present, Causal Relationship is a medical opinion of the physician which is of reasonable certainty and is supported by a rationale explaining the nature of the relationship between the diagnosed condition and the specific employment factors identified by the employee.